NASA's Curiosity Mars rover is expected to resume probing the Red Planet as early as next week, after it was stalled by a short circuit. Now, engineers have identified the short in the probe's drill. 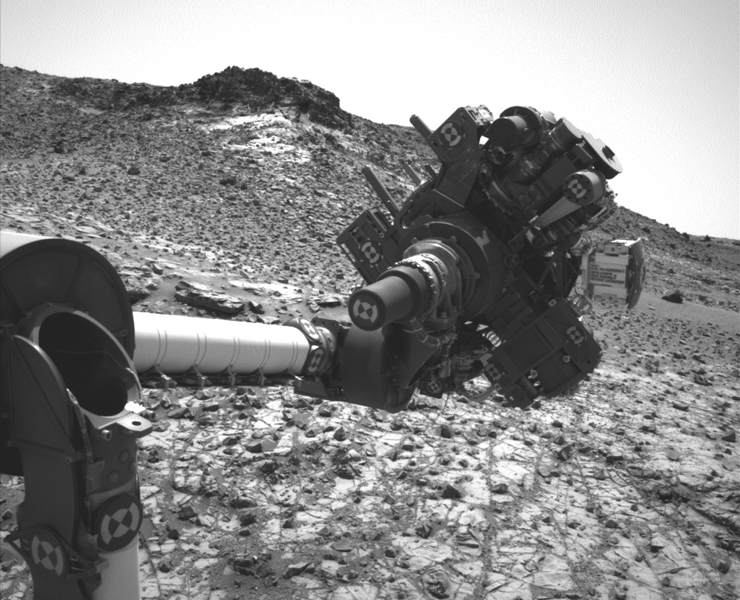 A fluctuation in current on Feb. 27 triggered a fault-protection response in the rover and halted the robot arm science operations. Work by instruments on the rover's mast along with environmental monitoring by its weather station have continued. "Diagnostic testing this week has been productive in narrowing the possible sources of the transient short circuit," said Curiosity Project Manager Jim Erickson of NASA's Jet Propulsion Laboratory, Pasadena, Calif. "The most likely cause is an intermittent short in the percussion mechanism of the drill. After further analysis to confirm that diagnosis, we will be analyzing how to adjust for that in future drilling." The sample-collection drill on Curiosity's robotic arm uses both rotation and hammering to penetrate into Martian rocks and collect pulverized rock material that is analyzed by instruments inside the rover. After testing the drill's percussion action, engineers found that an apparent short circuit occurred for less than one one-hundredth of a second as it began 180 up-and-down repetitions. Though only fleeting, they concluded that it would have been enough to trigger the fault protection. The $2.5 billion Curiosity successfully landed in Gale Crater in August 2012. Since then, it's been slowly making its way to the base of Mount Sharp, a towering mound of layered terrain in the center of the crater, stopping frequently to examine interesting soil and rocks. The rover has already accomplished the mission's primary goals, detecting organic compounds like those necessary for life as it is known on Earth and showing Mars once featured a habitable environment. A major long-range objective is to climb up the lower slopes of Mount Sharp to reach a transition zone that might hold clues about what caused the red planet to dry out.